What if Congress decides to start taxing workers’ health benefits as a means to raise revenue as part of an effort to rein in the federal deficit? More than half of American workers would either switch to a less costly plan, shop around, or drop coverage, according to new research from EBRI. The 2012 EBRI/MGA Health Confidence Survey (HCS) finds that if current tax preferences were to change and employment-based coverage became taxable to workers, 26 percent would want to switch to a less costly plan, 21 percent say they would want to shop for coverage directly from insurers, and 9 percent say they would want to drop coverage altogether. However, nearly 4 in 10 (39 percent) individuals say they would continue with their current level of coverage, up 10 percentage points from last year’s HCS findings. While changes resulting from the Patient Protection and Affordable Care Act (PPACA) have raised concerns as to whether employers will continue to offer health coverage in the future, the 2012 HCS finds that health benefits remain a key a factor for workers in choosing a job, and health insurance in particular continues to be—by far—the most important employee benefit to workers. The HCS examines a broad spectrum of health care issues, including Americans’ satisfaction with health care, confidence in the future of the nation’s health care system and the Medicare program, as well as their attitudes toward certain aspects of health care reform. On December 13, EBRI will hold its 71st biannual policy forum, “’Post’ Script: What’s Next for Employment-Based Health Benefits?” It is a question that has been on the mind of employers, lawmakers and policymakers alike for some time now. It predates the time that the structure for the Patient Protection and Affordable Care Act (PPACA) was put in place, has evolved, but not been resolved, as regulations were, and continue to be issued subsequent to its passage. It has remained on the minds of employers, providers, and policymakers following the various courts’ assessment of the various challenges to the constitutionality of the law, and even as the nation went to the polls last month. Today we know more than we once did about certain aspects of the law, its provisions and applications.¹And yet there is much yet to know about its broader implementation: How the insurance exchanges might work,² for example, or how their presence might affect or influence cost, access, or employer plan designs. Will employers step away from their traditional role in providing these benefits, or will these changes lead to an environment in which employers find them to be of even greater value to their retention programs and strategies? In addition, an overarching concern at present—not just for health benefits, but workplace benefits overall—is the potential impact that changes in tax policy³ could have on these programs, both direct and indirect. Our next policy forum will bring together a wide range of national experts on U.S. healthcare policy to share a post-election perspective on fiscal impacts from the federal budget, findings from the EBRI Center for Research on Health Benefits Innovation, and a sense of how employment-based health benefits might evolve as a result of the changes set to come. In a field as complex and sensitive as healthcare policy, we may not always know “what’s next”—but it’s our hope that the information, and interaction, at the EBRI policy forum will provide insights and clarity that can help. EBRI’s 71st biannual Policy Forum will be held on Thursday, Dec. 13, from 9:00 a.m.–12:30 p.m. at the Henry J. Kaiser Family Foundation, 1330 G Street NW, Washington, DC 20005. The agenda and registration information are available online here. For those not able to attend in person, a free live webcast of the policy forum will be provided by the International Foundation of Employee Benefit Plans, online here. ² For insights on the topic of health insurance exchanges, see “Private Health Insurance Exchanges and Defined Contribution Health Plans: Is It Déjà Vu All Over Again?” online here. ³ See “Employment-Based Health Benefits and Taxation: Implications of Efforts to Reduce the Deficit and National Debt,” online here. Workers routinely rank their employment-based health coverage as the most important benefit they receive, followed by a retirement plan—but the tax preferences that support them are drawing increased scrutiny. 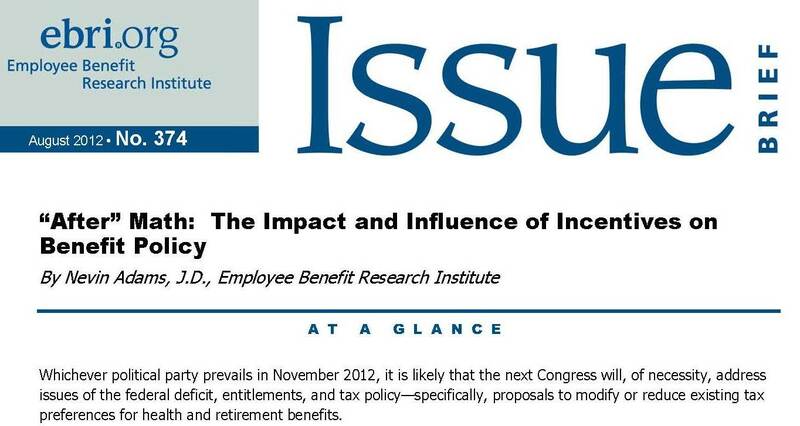 To examine the implications for private-sector health and retirement benefits, as well the costs and consequences and what the numbers are, the nonprofit, nonpartisan Employee Benefit Research Institute (EBRI) recently held a day-long policy forum in Washington, DC. Titled “’After’ Math: The Impact and Influence of Incentives on Benefit Policy,” this was EBRI’s 70th biannual forum on benefits issues. It drew about 100 experts, benefits professionals, and policy makers to provide their perspectives and predictions. As a new EBRI report about the forum notes, the reach and impact of these benefits is immense. Employment-based health benefits are the most common form of health insurance in the United States, covering almost 59 percent of all nonelderly Americans in 2010 and about 69 percent of working adults. 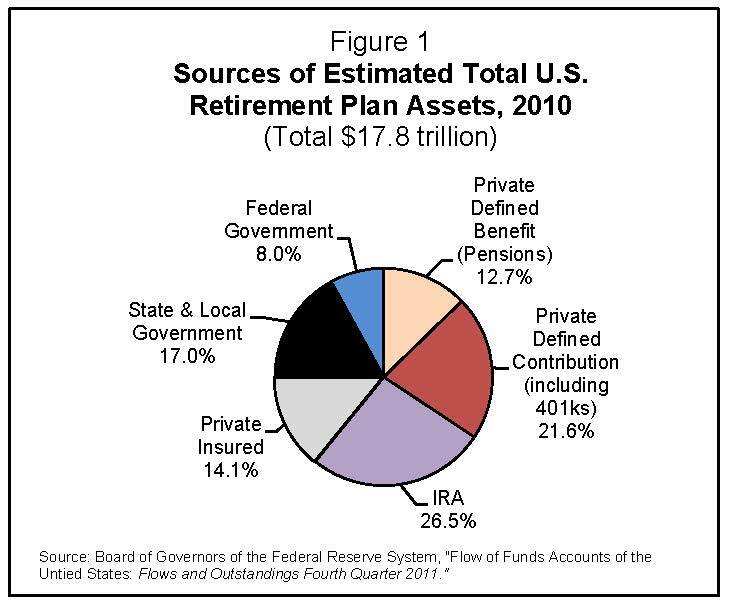 Assets in employment-based defined benefit (pension) and defined contribution (401(k)-type) plans account for more than a third of all retirement assets held in the United States, and a significant percentage of assets held today in individual retirement accounts (IRAs) originated as a rollover account from an employer-sponsored program. Workers routinely rank their employment-based health coverage as the most important benefit they receive, followed by a retirement plan. Since private-sector health benefits alone rank as the largest single “tax expenditure” in the federal budget, various proposals have been made to either reduce or even phase out the cost of that program to the government. Both for employers that sponsor these benefits—and the workers who receive them—the implications are enormous, the EBRI report points out. “When you look at some of the recent proposals for reform, benefit plan tax incentives are an area of total and complete volatility, and neither employers nor workers can have any certainty of what lies ahead,” said Dallas Salisbury, president and CEO of EBRI. The press release is online here. The full report is online here. Last week, House Ways and Means Committee Chairman Dave Camp (R-MI) released a report that included responses from more than 70 percent of America’s Fortune 100 companies—a report that indicated that those employers could “save hundreds of millions of dollars a year under the new health care law by simply terminating health insurance for their workers and dumping these employees into taxpayer-funded health care exchanges” (see the committee’s report, online here). This, of course, follows recent arguments challenging the constitutionality of the Patient Protection and Affordable Care Act (PPACA) before the United States Supreme Court—with a ruling anticipated by the end of June. At which point, regardless of the outcome, healthcare reform seems likely to remain an issue for the 2012 political campaign. What remains to be known is what that will mean for employment-based health coverage(1)—and American’s confidence in their health care system. Last year, EBRI’s Health Confidence Survey(2) noted that, in 2011, 57 percent of individuals with employment-based coverage were extremely or very confident that their employer or union would continue to offer health coverage. That was down from 68 percent in 2000, but most of that erosion occurred between 2000 and 2002. Indeed, other than a one-year dip in 2010 (to 52 percent), the percentage who were extremely or very confident has remained just below 60 percent. And, for the very most part, individuals who had such coverage were satisfied with it (60 percent of those with health insurance coverage are extremely or very satisfied with their current plan, and 29 percent were somewhat satisfied—see this EBRI analysis, online here. The 2011 HCS(3) did highlight some areas of concern. While more than half (56 percent) said they were extremely or very satisfied with the quality of the medical care they have received in the past two years, just 18 percent were extremely or very satisfied with the cost of their health insurance, and only 15 percent were satisfied with the cost of health care services not covered by insurance. Moreover, the 2011 HCS also found that individuals have a low level of confidence that they can afford to purchase health coverage on their own—even if their employer or union gave them the money to do so. This year’s Health Confidence Survey (HCS) will be fielded in July, allowing time for the Supreme Court’s ruling to come to light, so that survey respondents can better assess and reflect on its impact on their circumstances. In this, the 15th annual HCS, the issues of health care cost, coverage, quality, and confidence in the future of the employment-based system are, if anything, more important than ever—and the need for a clear understanding of the American public’s attitudes on health care never greater. (1) The Congressional Budget Office recently revised its estimates of the number of people projected to have employment-based coverage in the future. 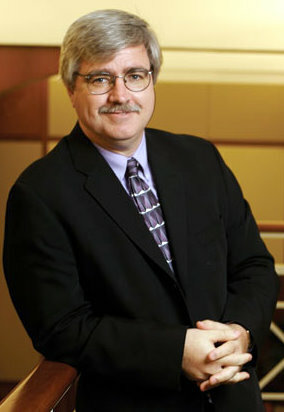 In a recent blog post, Paul Fronstin, director of EBRI’s Health Education and Research Program, said: “As the CBO notes in a footnote for its 2019 estimates, as a result of PPACA, about 14 million fewer people are expected to have employment-based coverage (about 11 million individuals will lose access to employment-based coverage, and another 3 million will decline employment-based coverage and enroll in health insurance from a different source), while about 9 million will newly enroll in employment-based coverage under PPACA.” (see Fronstin’s blog, online here). (3) Additional information from the 2011 HCS is online here.